Managed SQL Database as a Service for all developers. PostgreSQL is one of the world's most popular relational database management systems. Millions of developers and companies rely on PostgreSQL as their transactional data store of choice to drive application health and decision-making. And developers with knowledge of Oracle or MySQL databases can use their SQL querying experience to quickly leverage PostgreSQL's capabilities as a fast, functional, and powerful data resource. We've taken Heroku's operational expertise of scaling applications, and integrated useful runtime features for developers worldwide, and we've applied it to the data stack. Heroku's integration of managed data services alongside our application runtime provides a seamless approach to building applications with a solid data layer built in - all while having complete control of how you want to build your applications on the Heroku platform. We've been running one of the world's largest fleets of Postgres databases for years, providing us with a deep understanding of how to make it better for our customers. Whether it's an index that’s not being used, security patches that have to be applied, or guidance relevant to ensuring your database is performing well, we’re here to guide you along the way. Heroku Postgres helps you maximize your data instead of spending time on database setup and maintenance. Test new schema migrations, manage database access levels and protect queries, scale horizontally, and allow your team to quickly access data. Whether it's features like Continuous Protection or seamlessly applying the latest security patch, you can rest easy as your database is being protected by our behind-the-scenes efforts. Forking a database is just like forking source code. Perfectly clone your database with a single command. Test new schema migrations by simply forking your production database and running the new migrations against the fork. Load test by forking and running your testing environment against it. Followers are read-only replicas of a database. Followers stay up-to-date with changes to your database and can be queried. Traditionally, setting up and maintaining replication is a difficult and specialized task. But with followers, it just works. Followers provide horizontal scalability by distributing database read traffic. In order to make good business decisions against your data, it is critical that you can access, query, view, and share it. With Dataclips, anyone on your team familiar with SQL can easily create reports against live production data, and securely share the results within your organization, or with the world, using a unique URL. 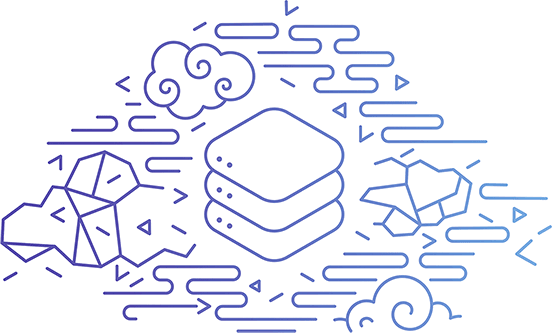 Managing your data - and who has access to it - is easy with Heroku Postgres. Credentials allow you to set and manage varying access permissions. You can also tune Settings to adjust the way your database is administered. Continuous Protection keeps data safe. Every change to your data is written to write-ahead logs, which are shipped to multi-datacenter, high-durability storage. In the unlikely event of an unrecoverable hardware failure, these logs can be automatically 'replayed' to recover the database to within seconds of its last known state. Your data can be rolled back with a single command. This can be used to quickly recover from accidentally dropped tables, to conduct an audit of historical data, or for any other case where you need to go back in time. With rollback your data is safe from any situation you could encounter. Heroku Postgres databases are constantly monitored to ensure the health of your database. Should any health check fail automated processes are kicked off to restore your database to ideal working order. 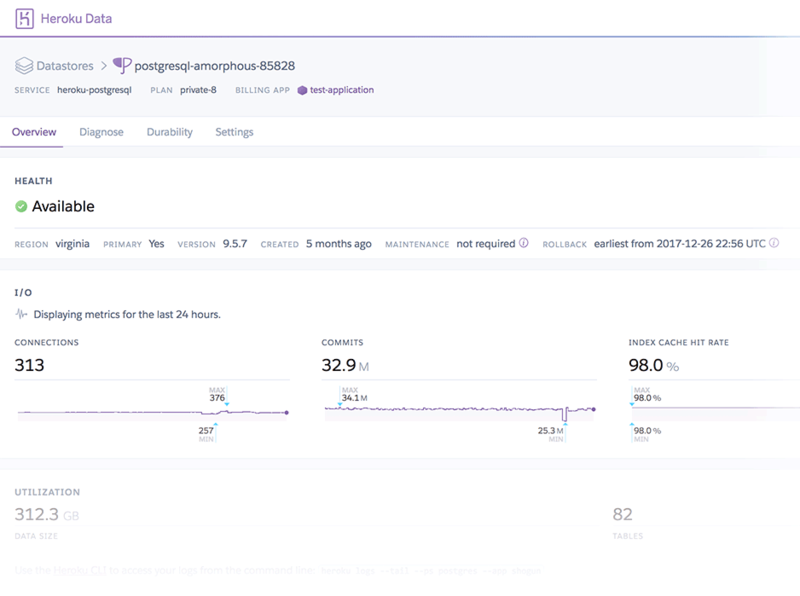 Where application uptime is critical the Heroku Postgres Premium tier and above offers higher availability through automatic failover. We take care of uptime so you can focus on growing your application. At Heroku, trust is our number one value. We regularly perform audits and maintain PCI, HIPAA, ISO, and SOC compliance to further strengthen our trust with customers. Learn more by visiting our compliance center. Postgres 11 on Heroku allows us to manage some of our most complex data use cases at scale, including partitioning large tables and parallelizing advanced queries. This allowed our developers to stay focused on working with the data instead of building the infrastructure to support it. Dataclips are a great example of Heroku’s focus on developer happiness. Dataclips save us so much time and effort in accessing and sharing live data, which in turn helps us keep our internal teams and customers happy. Upgrading to Postgres 11 was seamless on Heroku. And whenever the word ‘seamless’ is involved in promoting library, language, or database versions, I'm loving life. By introducing safe and performant schema migrations of non-nullable columns in a single step, Postgres 11 has made the already excellent developer experience of Heroku Postgres even better. As our business has rapidly grown, Heroku Postgres has scaled with us. Our Heroku Postgres database is performant, secure, and reliable, and we sleep better at night knowing that Heroku's team is monitoring it for us 24/7. It's allowed us to quickly create a sophisticated development pipeline that would have been difficult otherwise. It's hard to imagine trying to build our business on any other infrastructure. Have a question? Give our sales team a call. +1 (866) 278-1349 (US) or +44 800 808-5158 (non-US).